It was a connection between caregivers. 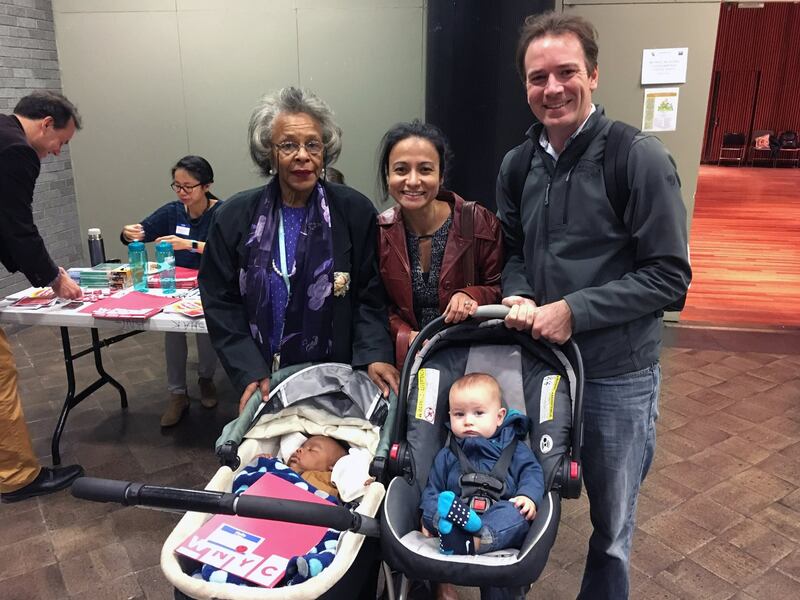 The Harlem Heat Project’s Julia Kumari Drapkin, who had come to New York with her infant son to take part in the initiative’s Oct. 15 community workshop, nodded across the room to Helen Jones, a Harlem resident and host to one of the projects heat index sensors, who sat rocking her own grandson’s baby carriage. The exchange was one of the more poignant during a four-hour-long gathering at New York’s City College of non-profit professionals, community organizers, public health researchers, weather experts, and urban planners, along with some of the Harlem residents whose homes were outfitted with the sensors this summer. 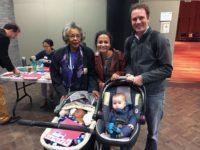 Harlem resident Helen Jones and her grandson, left, and Julia Kumari Drapkin, with her son and spouse, at the Oct. 15 Harlem Heat Project workshop. For Drapkin, of project partner ISeeChange, it was the connection with people like Jones that made the six-month-long project so successful. Jones was not just a participant ID number on a slide, or a temperature reading on a sensor, said Drapkin. She became a real person, with a real problem, and a real investment in the solution. Another sensor host, Michele Holmes, sat a few seats over from Jones. This summer, she said her apartment in a Harlem public housing complex was so unbearably hot it was hard to sleep. The sensors alone could do nothing to alleviate the pervasive high temperatures; they could only record and report the existing problems. But when Harlem Heat Project partner WNYC featured an interview with her on air in July, one listener was so affected by Holmes’ story that she bought her an air conditioner. Holmes’ cries of joy were broadcast city-wide. According to Drapkin, the Harlem Heat Project went beyond the “lame old way” of conducting investigative journalism, which she said separates data from storytelling and establishes too distinct a disparity between scientific experts, journalists and the affected community. In that model, a scientist does research and publishes it, a journalist reads that research and hunts for community members with stories that support that research, a policy-maker maybe reads the story, and maybe works with the community to find a solution, or maybe not. But she suggests the Harlem Heat Project represents a new form of media with more impact, engaging scientists, journalists, and community groups simultaneously. For instance, as temperature readings spiked, Harlem residents were able to explain how heat affected them in real time. It is this inextricable link between data and lived experience that gives the project its power, said Drapkin. The group of approximately 40 who gathered at the workshop first heard from scientists about findings that indoor heat had reached unhealthy levels in many of the homes tested. But they were then challenged to begin answering the questions of how can we mitigate the risks associated with summer heat, engage communities, and ultimately build a more resilient city? 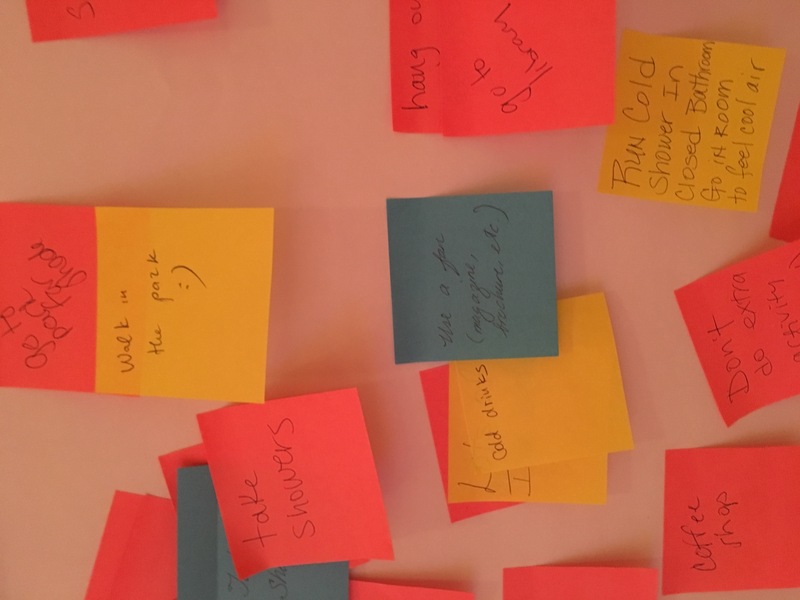 The workshop began with an icebreaker challenge (perhaps better described as “ice-melting”) to get people thinking critically about how to solve the problem of overheated apartments. 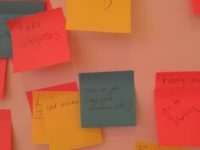 Workshop participants brainstormed dozens of ideas for staying cool. 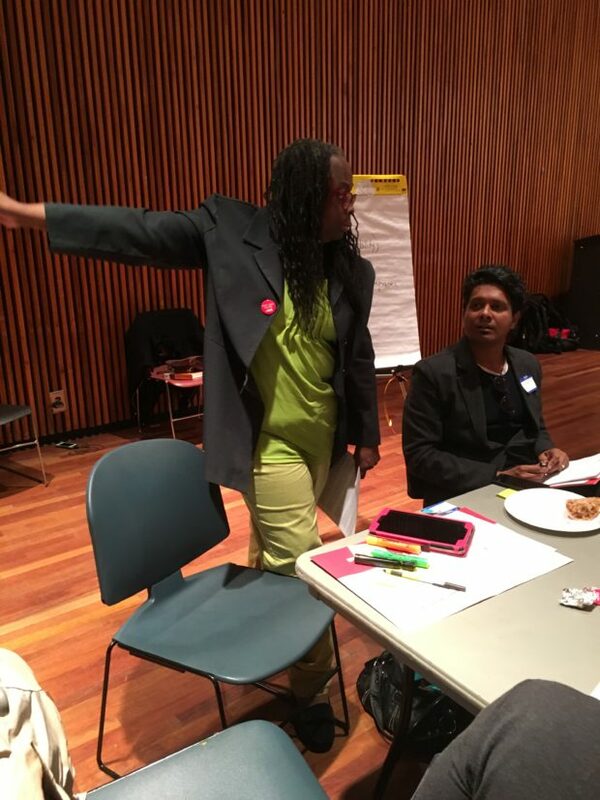 Next, teams were asked to continue thinking broadly and ambitiously, but to connect these ideas to Harlem residents. They were given sample profiles of the kinds of people most affected by the heat—people much like Jones or Holmes. What are their goals? Their motivations? The frustrations and obstacles they deal with each day? These questions were meant to remind groups that the issue is not an abstract one: Heat extremes affect real people in their daily lives. For the sample residents, many of whom lived in NYCHA public housing, finances were often limiting factors in maintaining a cool and healthy living space. While moving to an apartment or a neighborhood with better facilities may have been a goal for some, most groups agreed that the costs and burden associated with finding a new residence would be detrimental. Instead, they suggested, solutions should encourage the use of public space, emphasize community building, and find ways to keep cool without spending money or relocating. Family and community health were priorities, as was fostering a sense of ownership over public space. Armed with a greater understanding of the problems and the people, all four groups then embarked on developing plans of action. They workshopped each pitch in small groups, and then delivered their proposals directly to a panel of high-level experts. The panelists hearing the pitches included a top city official on heat emergency planning, Megan Pribram, who is assistant commissioner for planning and preparedness with NYC Emergency Management. Other panelists were Leah Flax, a senior manager of city solutions for the Rockefeller Foundation-supported global initiatives 100 Resilient Cities, and Cecil Corbin-Marks, the deputy director and head of policy inititives for the WE ACT for Environmental Justice, based in northern Manhattan, and the Harlem Heat Project’s partner in the community. Matthew Schuerman, editor at project partner WNYC, moderated. Reach out to local community and government. City agencies have to consider the needs of 8 million people, but local groups can target individual buildings and communities. Tell the mayor; tell your city council members; tell your tenant representatives. Write grants. There are small pots of money in local government that can and should be allocated towards helping New Yorkers handle summer heat, and build better buildings. There are also larger pots, such as the New York City Green Infrastructure Grant, which provides billions of dollars in funding for green building projects like the rooftop gardens and terraces some teams proposed. But one thing became abundantly clear: there are solutions, and they are implementable. “None of these ideas are going to fail,” said Corbin-Marks. He did caution there was no single silver bullet, and that for any of these plans to become reality, they should be merged and adapted into multi-pronged solutions. As the afternoon came to a close, Harlem Heat Project coordinator Adam Glenn of AdaptNY urged participants to extend the conversations beyond the boundaries of workshops such as these. The strategies developed here must be coupled with policy changed, and bolstered by increased funding. And for an audio report on the workshop output, click the player below listen to this interview with project partner Matthew Schuerman of WNYC. Posted in Harlem Heat, Neighborhoods Project and tagged with Adaptation, AdaptNY, climate change, Harlem, health, heat, heatwaves, resilience. RSS 2.0 feed.